It is a matter of immense pleasure that CUI has won the 1st FPCCI Achievement Award for its outstanding services in the category of education & training! FPCCI (Federation of Pakistan Chambers of Commerce & Industry) is the apex body of trade and industry of Pakistan. FPCCI recognizes and honors the dedicated and enterprising organizations that have made sustained and lasting contribution in socio-economic development of the country. CUI’s award is the first FPCCI achievement award of its type being conferred on any HEI in Pakistan. Some of the award recipients in other categories included, among others, industry giants such as PARCO, Guard Group, Al-Karam, NBP, Arif-Habib Securities, EFU Insurance, Hilton Pharma, and Rafhan. This award is an evidence of CUI’s efforts to create longstanding partnerships with industry and will help it furthering the cause of the country’s socio-economic development. It will also help in attracting high caliber potential faculty and students, and enhancing competitive standing. This Achievement Award (gold medal) along with a certificate was conferred by the Hon’ble Dr. A. Q. Khan in an impressive ceremony held at PC Karachi on 22nd June 2013. 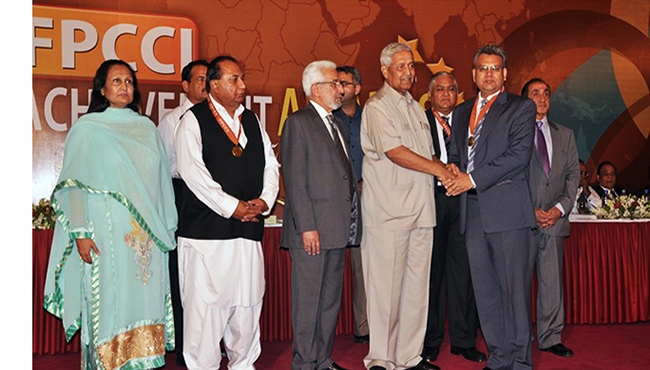 Mr. M. Raza Ahmad Khan - GM (UIL/TT), ORIC received the award on behalf of CUI.